Have a home that needs to be cleaned out? 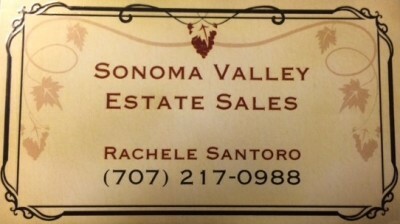 If a loved one has passed, or you need to downsize, or if you simply need to get rid of your stuff - call Sonoma Valley Estate Sales to get a free consultation of your specific situation. With no out of pocket expenses, let the staff of Sonoma Valley Estate Sales do all of the work and simply forward you profits when we are finished. We specialize in complete home cleanouts, packed Estate Sales with lots of customers, correct pricing of: art, collectibles, clothing, antiques, jewelry -costume and precious, old toys, sewing, breyers, war memorabilia, furniture, electronics, computers, stamps, kitchen, tools, shed, garage, vehicles, books - old and new, purses, luggage, etc... you name it we have sold it.